Turf grases: The are sun plants! Has your lawn become thin, patchy and started to die out on areas? You may have too much shade. Lawn grasses are sun plants and require a good six hours of direct sun a day to thrive. While St. Augustine is somewhat more shade tolerant, it is not meant to be grown in full shade. Over time, it will thin out and decline. No amount of water or fertilizer will stop this from happening. Even St. Augustine needs a good four hours of sun a day to perform. In the photo above you can see the shaded lawn thinning and dying out in patches. If your trees are large, have dense or low canopies, you should consider changing out thinning areas of lawn to more shade tolerant ground covers. 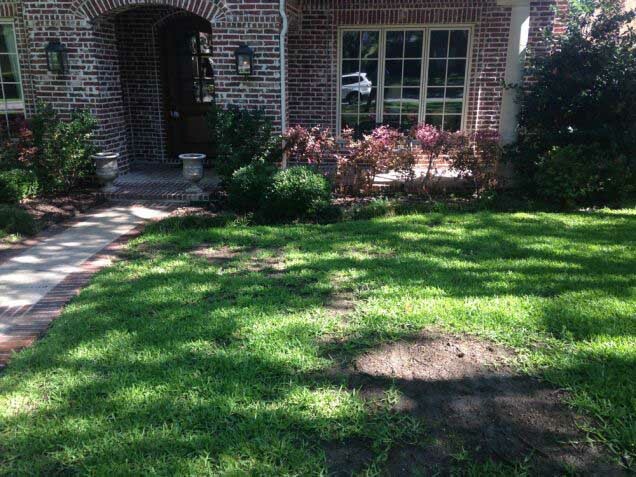 Often, trees are improperly pruned to let in more light for lawns. Be sure to consult a certified arborist about pruning your tree in order to save your lawn.